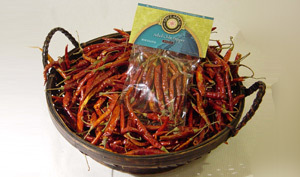 Translated as a “tree like” plant with thick woody stems, this delicate and slender, bright red variety is closely related to the Cayenne pepper. De Arbol is thin fleshed, with a tannic, smoky, and grassy flavor and searing, acidic heat. A staple in Southwestern cuisine. Use in sauces, soups, and stews. Add to any Mexican dish for extra heat. Excellent for making red chile sauces and enchilada sauces. 7 Heat Rating.